One of my new (school) year’s resolutions is to reallocate some of my time from television to books. And, while there are many books about education, from time to time I will blog about the education/leadership books I have read and made connections to our work in West Vancouver, and the broader education community. One such book is the well-researched Childhood Under Siege by Joel Bakan. 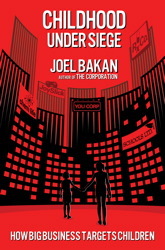 Bakan is a professor of law at UBC, and the author of the widely cited book and film The Corporation. His latest book examines how big business targets children. And while its viewpoint is largely focussed on the United States, and interspersed with some Canadian examples, it is a cautionary tale beyond these borders. Bakan focuses on five areas in which corporations are targeting and harming children: media, pharmaceuticals, toxic chemicals, child labour, and education. While all five have links to the school system, I found the section on media particularly compelling. Addicting Games is one of the sites he mentions. The site is owned by Nickelodeon and is one of the largest sources of online games. Many of the site’s games deliver emotional content interactively – players can act out and control virtual acts of brutality and murder rather than just passively watching actors or animated figures do so, as they would on TV. Bakan’s book does work into the subject of education more deeply, examining the string of US policies that have relied heavily on standardized tests. I found this to be sad, but also reassuring, knowing how we are forging a different path in BC, and in Canada. As parent groups look for study books for the fall, Bakan offers one with links to both parenting and schooling. Bakan’s book is a call for community and regulatory solutions to the areas he identifies. I am interested in your thoughts, and the views of those who have had a chance to engage with the book and/or its themes. For West Vancouver blog readers, the book is available through the West Vancouver Memorial Library. When I stopped watching TV years ago, I was amazed at how much free time I suddenly had. I am sometimes frustrated that I cannot participate in the conversations in my staff room about “that latest show” but I have hours and hours of my life back. Corporations targeting children is especially problematic. Most children do not think critically or reflectively about what they watch or play, and do not consider the relationship between the advertising and indoctrination that happens and their later choices in life and many parents just do not have the time to keep track of all of the media their children consume. What is concerning here is that the indoctrination is not done by people who have the interests of either society or the children in mind. If corporations had the best interests of society in their sights, I think we’d see a much more equitable society. If they had the best interests of children in mind, we’d see much less childhood obesity. I am only three weeks into my life without tv experiment, and I am finding more time for sure. Given how much other screen time I have, it is probably healthy for me to not watch tv on top of that. Thanks for the additional link to what you have previously written. Beyond Happy Meal toys at McDonalds, and a few other similar examples, it is not something I had previously given a lot of thought to. I also get the sense it is trending to be a bigger issue, not smaller issue moving forward. I am presently about halfway through this book, and I, too, am impressed with it’s thorough research and interesting viewpoints. I am somewhat surprised by the American slant, especially since he is Canadian (as you indicated, a Law professor at UBC, and incidentally, he, his wife and their children live next door to my parents!). He certainly presents much for educators and parents to think about, and makes me question some of what I had trusted was safe in the lives of my children. Most resonating for me as an educator is the quote he cites throughout the book from Nelson Mandela, “There can be no keener revealation of a society’s soul than the way in which it teats it’s children”. We need to keep this in mind in our business, too. If there was one disappointment from the book it would be that it largely used American examples. His advocacy around regulation is interesting – given how so many call for smaller government and personal choices. Let me know if you use your connection to get him to speak at your school . . .. When will the kids be important?. The sociologist Zygmunt Bauman says in Liquid Life (2006): Nowadays, liquid life reorganizes the children´s soul. They wish consum, they need to shop to construct their identity. Thanks for the post. Sounds like a book worth the read. As an educator and a parent, the themes are not unknown to me. The people I know in the homeschooling arena are familiar with some of this targeting and work hard to provide another way for their children. This past week, in the public system, our son became friends with a delightful boy, age 7, who knows a lot about Halo and has an x-box and Wii, but cannot ride a bike. I mean it, he can’t ride… at all. Sad… dare I say, wrong? We haven’t had cable TV for 8 years. I’m sure we read more because of it. Our children are not deprived because of it. They rent DVDs from the library when they want to. But they’ve never sat through the whole of a feature film. And yet, they can hold their own when the playground play becomes enmeshed with media characters. The influence of pharmaceuticals is the scary one with some of the farthest reaching consequences for children and, in turn, their parents and teachers and future employers. And, BTW, there are 6 copies available in the North Van Libraries. Thanks for the comment. The chapter on pharmaceuticals was really new to me. I am quite familiar with some of the arguments around media and kids, but didn’t realize what was taking place in the medical field. He paints a very concerning picture of motives of those involved. One question: Are there any safe spaces for him to ride a bicycle? I know that our son can ride, but this is possible for him because we’ve spent many months living on a small island in our time away from the city, and quite simply, it is safer for him to learn. Depending on the community children live in, it can actually be really difficult to find safe (free from cars) space for kids to learn how to bicycle in. Great post Chris- I’ll have to add this one to my reading list. I’d particularly like to read the chapter on education. It seems there is much in education (especially when it comes to our early learners) that may filter down from an agenda elsewhere. Emotional and social learning is so important and our children need the time and space to grow these essential skills. One of our greatest educators Maria Montessori coined the term “follow the child” and to that end she realized that as parents and educators we need to refrain from overwhelming and interfering with a child’s innate capacity to grow and learn spiritually, psychologically and physically. Thanks Val – you might be a bit disappointed on the chapter on education as it is quite heavily American. I have the book on my shelf so you can come by to borrow it when you like.